Objectives: To evaluate attitude of community pharmacists towards health education, promotion and screening, assess the extent of their actual involvement in such activities and identify barriers for their provision. Settings: Community pharmacies in Khartoum State. Method: A structured, self-administered, piloted questionnaire was distributed to the pharmacists in charge of 274, randomly selected, community pharmacies. The questionnaire was divided into 5 domains; demographic characteristics, attitude, involvement, screening and barriers. Attitude responses were measured by a 5-point Likert-type scale. Descriptive statistical analysis was used. Main outcome measures: willingness of community pharmacist to participate in public health activities, their current involvement and the barriers they encounter. Results: Response rate was 67 %. The majority of community pharmacists (>70 %) is willing to take part in public health services and consented to be trained on behavioral modification for provision of more effective health education and promotion services to the public. Currently a high proportion of community pharmacists are providing health information on healthy diet (4.38 ± 0.76, 89.1 %), obesity and weight reduction (4.15 ± 0.78, 78.1 %), exercise (3.93 ± 0.83, 76.6 %), smoking cessation (4.15 ± 1.01, 76.1 %) and contraception methods and medicines (3.98 ± 0.95, 73.4 %). However, their involvement is achieved through the process of traditional advising during prescription filling. Blood pressure measurement (89.1 %) and blood glucose testing (85.9 %) were highly ranked by community pharmacists as acceptable and can be easily handled. Lack of time, training, official recognition for pharmacists’ health promotion activities, the concept of team work with other health care professionals topped the barriers. Conclusion: The surveyed community pharmacists favor the provision of public health activities following appropriate training and reduction or removal of barriers. Further interventional studies regarding application of a health education and health promotion model to selected populations in community pharmacies are recommended. The authors are grateful to participating pharmacists and community pharmacy owners. Our appreciations are extended to the pharmacists who helped in distributing and collecting the questionnaires. We also thank the faculty of the pharmaceutics department for their constructive discussions and opinions. Sharma M. Theoretical foundations of health education and health promotion [Internet]. 2nd ed. London: Jones and Bartlett learning, ISBN 978-0-7637-9611-2; 2011 [cited 2012 May 20]. Available from: http://books.google.com/books?hl=en&lr=&id=_lDt2Z6Ifx4C&oi=fnd&pg=PP2&dq=Theoretical+foundation+of+health+education+and+health+promotion&ots=yltnRcdkYX&sig=8iV5qBHgso7qzQy-JpkDL52iZb8. Berg J, Dodd S, Dodd S. The role of a community pharmacist in diabetes education. J Endocrinol Metab Diabetes South Africa (JEMDSA) (Internet). 2010 (cited 2012 Jan 4);14(3):148–50. Available from: http://www.ajol.info/index.php/jemdsa/article/view/50361. Dyson L, Renfrew MJ, McFadden A, McCormick F, Herbert G, Thomas J. Policy and public health recommendations to promote the initiation and duration of breast-feeding in developed country settings. Public Health Nutr (Internet). 2010 Jan (cited 2012 Mar 30);13(1):137–44. Available from: http://www.ncbi.nlm.nih.gov/pubmed/19686608. Sinclair HK, Bond CM, Stead LF. Community pharmacy personnel interventions for smoking cessation. Cochrane Database Syst Rev (Internet). 2004 (1):CD003698. Available from: http://www.ncbi.nlm.nih.gov/pubmed/14974031. Kennie-Kaulbach N, Farrell B, Ward N, Johnston S, Gubbels A, Eguale T, et al. 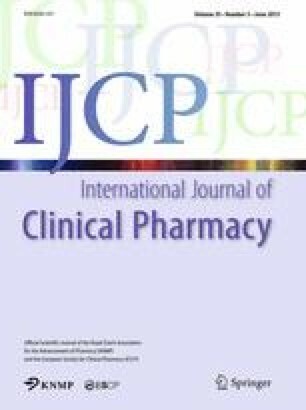 Pharmacist provision of primary health care: a modified Delphi validation of pharmacists’ competencies. BMC Family Pract (Internet). 2012 (cited 2012 Apr 3);13(1):27. Available from: http://www.biomedcentral.com/1471-2296/13/27. Hassali M, Subish P, Shafie A. Perceptions and barriers towards provision of health promotion activities among community pharmacists in the State of Penang, Malaysia. J Clin Diagn Res (Internet). 2009 (cited 2012 May 19);3:1562–8. Available from: http://www.jcdr.net/articles/pdf/490/421.pdf. Lwanga S, Lemeshow S. Sample size determination in health studies: a practical manual. (Internet). World Health Organization; 1991 (cited 2012 Jul 8). pp. 25. Available from: http://www.cabdirect.org/abstracts/19912082864.html. Naing L, Winn T, Rusli BN. Sample size calculator for prevalence studies. 2006. Available from: http://www.kck.usm.my/ppsg/stats_resources.htm. Eades CE, Ferguson JS, O’Carroll RE. Public health in community pharmacy: A systematic review of pharmacist and consumer views. BMC public health (internet). BioMed Central Ltd; 2011 Jan (cited 2011 Aug 4);11(1):582. Available from: http://www.pubmedcentral.nih.gov/articlerender.fcgi?artid=3146877&tool=pmcentrez&rendertype=abstract.